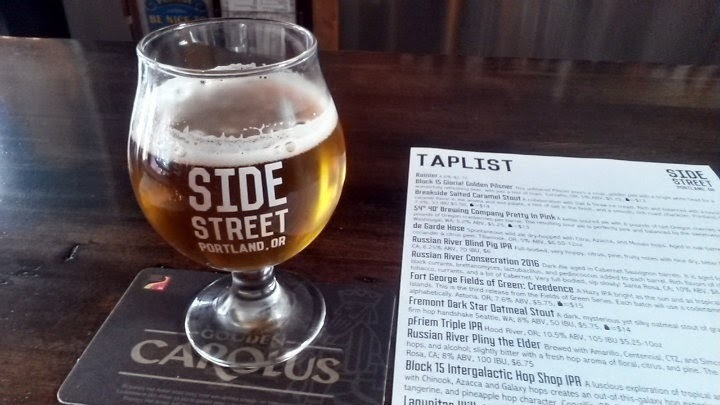 I generally don't head to many taverns, but the lure of a solid taplist and the chance for Pliny the Younger made it a requirement to stop here. 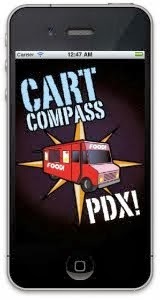 The food menu is mainly pizza, salads, and tater tot dishes baked in their oven. 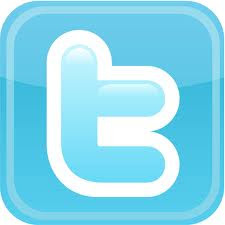 The tots take the longest, at least 20 minutes. 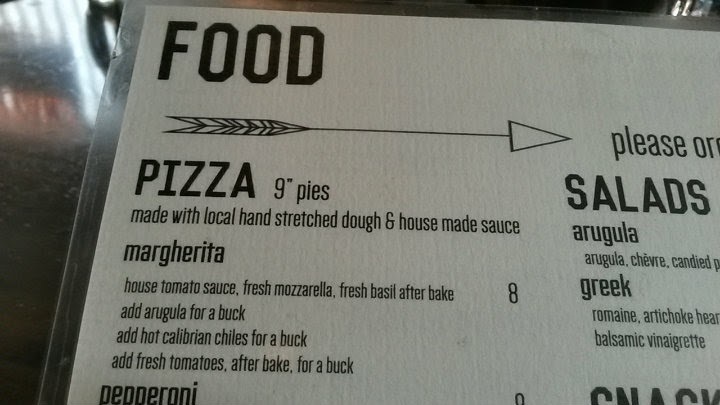 The pizzas may generally take around 10 minutes to fully bake. 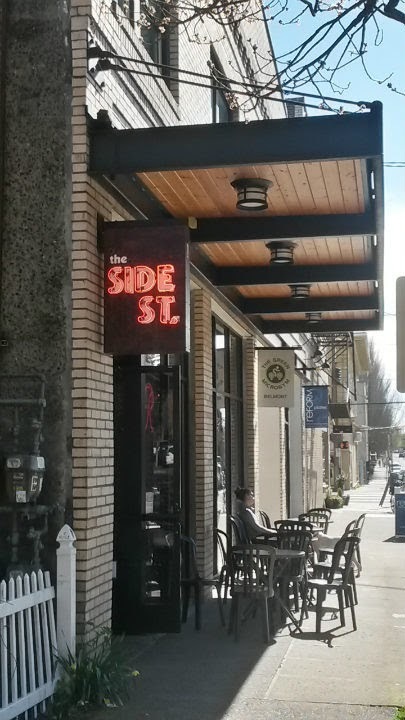 I first came here on March 8 for the tapping of Pliny the Younger, which I go more in-depth about on my beer blog, Not surprisingly, a lot of people showed up for the event. The beer tapped at 7 PM, but even for a space that generally doesn't get a ton of foot traffic, nearly all the tables and bar seats were taken by 6:45. I fortunately scored a seat near the taps - which also meant that people otherwise gathered behind me to get their beers for most of the night. 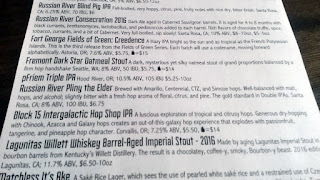 Still worth it to get the best possible shot of the taplist, which also included Pliny the Elder, Blind Pig, and Consecration. 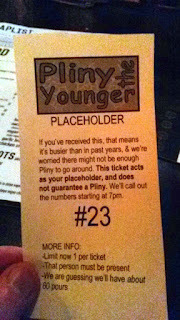 Employees started handing out placeholder tickets for Pliny the Younger, and I got ticket #23. About 10 minutes after tapping, I got my 10 oz pour for $7.50. Pretty much on par with the prices I've seen. I also ordered a Margherita pizza ($8) with Calabraian chiles ($1 more), but the lighting was not the greatest. At the time, I still had my old, horrific phone battery that couldn't hold a charge for beans, so a flash photo was out of the question. Because the place was so busy, the oven was full all night. Because the oven was full, food items took longer to cook. Wait times for food were about 45 minutes around 7 to 7:30 PM. 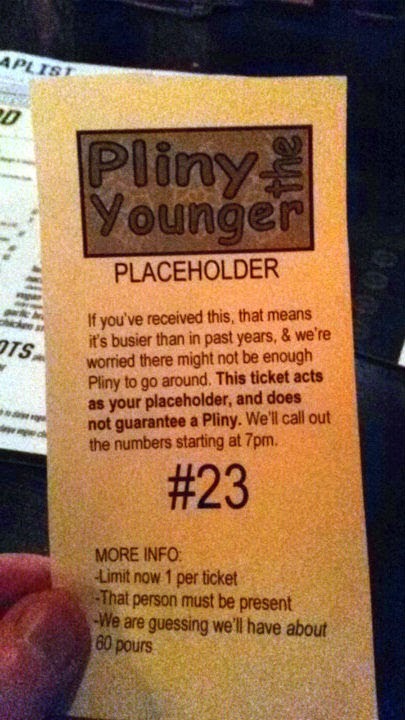 At first, I was wondering if the people getting placeholder tickets late (into the 50s for numbers) would even get a pour. I noticed some of the pours were slightly less about half an hour in (maybe slightly more than half the 12 oz tulip glass instead of the 3/4 pour). That certainly extended the time it was on tap, and virtually everyone who stayed and had a ticket got their pour. I read that there was a 2 glass PtY limit here, so anyone else who wanted another after all tickets were called could get a second helping. I was tempted, but passed on another pour. 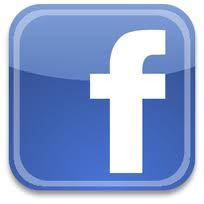 The staff handled the PtY tapping very well, and were very kind throughout. To stay hydrated and to pass the time, I downed about a liter of water while there. I left around 8 PM, with the place still full of patrons. 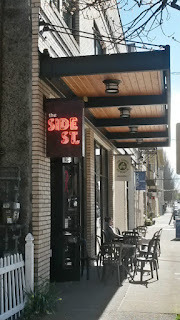 A couple days later, I returned to Side Street around 1 PM - and a stark contrast to Pliny night. Maybe five patrons total in the entire place, as opposed to over 75 two nights earlier. But hey, I had a new phone battery and the benefit of sunlight, so I could take better photos. 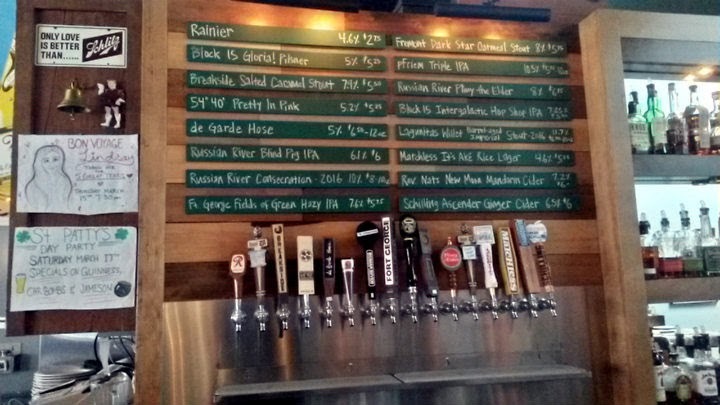 The taplist largely remained the same from Pliny night. 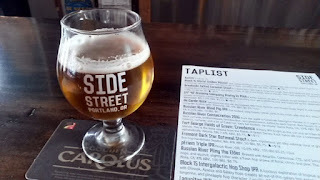 pFriem's Triple IPA had been on the taplist before Pliny the Younger briefly replaced it, and pFriem was back on again for my second visit. 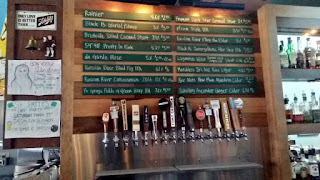 The same guy behind the bar from Pliny night was also present on my second visit. He vaguely remembered me (a fairly impressive feat). He also mentioned that Pliny the Younger lasted 70 minutes before kicking, which meant the keg kicked not long after I left on Pliny night. I got the same pizza I ordered two days before, but enjoyed a 10 oz pout of Pliny the Elder with it this time. I enjoyed the pizza both times. 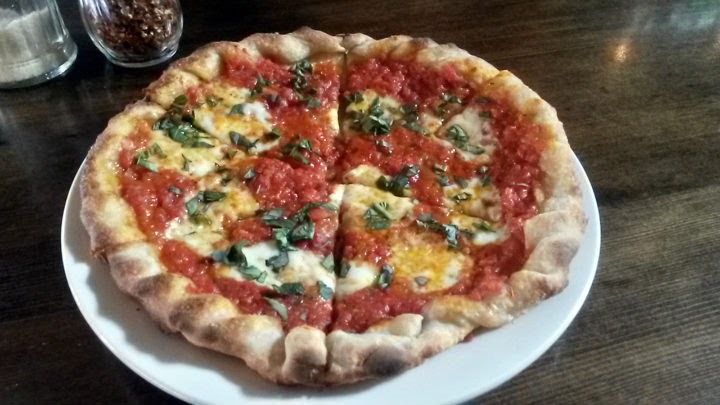 The added spice from the Calabrian chiles works so well with the sweet tomato sauce, melted cheese, and fresh basil. The chiles apparently are part of the sauce, as I didn't otherwise see chiles in there. I also loved the crunchy braided crust, which I got a much better photo of the second time.Pliyn the Elder, of course, is still awesome every time I get it. I'm lucky to be in a city that routinely gets it. I learned that Side Street Tavern gets Pliny the Elder about once a month. 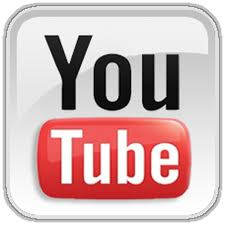 Perhaps in the past, had word gotten out about this, the place would probably be busy all the time just for that. 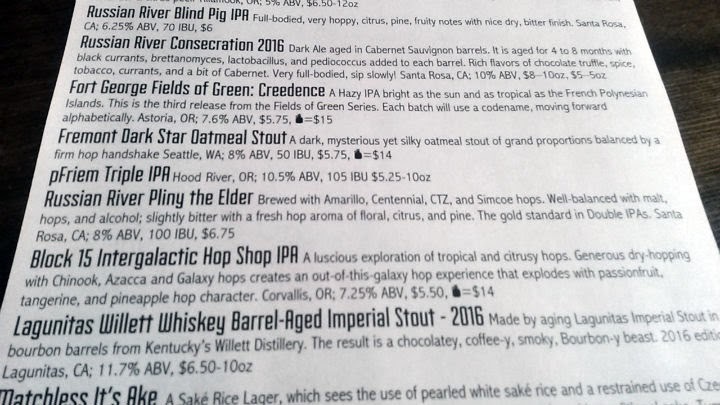 But with so many options around Portland, and the breweries all upping their games, Pliny the Elder no longer has the demand it once had. 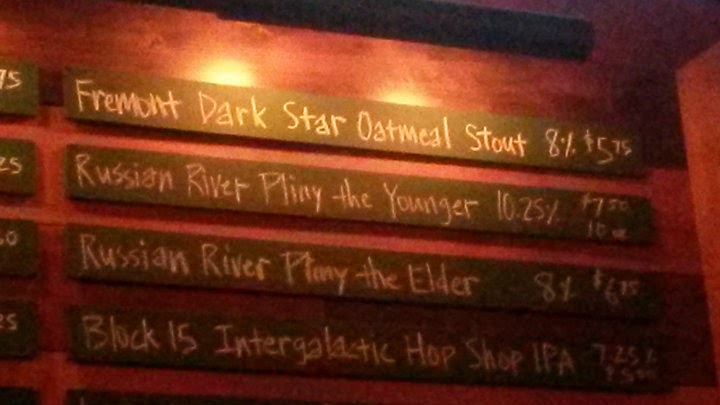 Still, people will get Pliny the Elder. A group of women ordered Pliny and asked the guy to take a photo of the tap handle to send to their friends in Colorado. I woulda done the same for my friends, but I'm just a lazy panda, so they get the shot of the board instead (see above). It's all street parking in this area. Whenever I'm there, there's little parking available, as you're adjacent to a residential area. 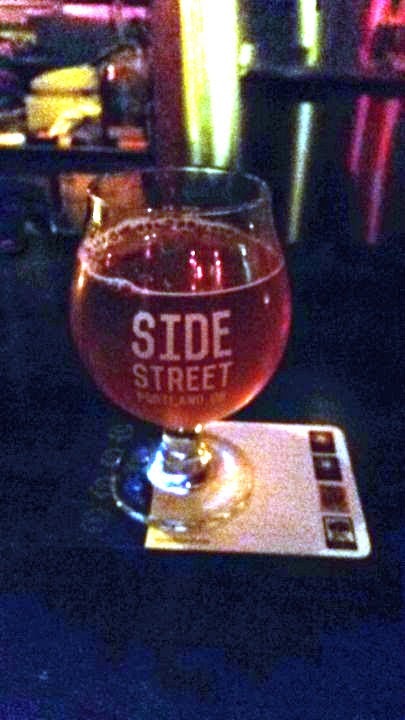 I parked about three blocks away on Pliny night (got very lucky on the parking) and parked maybe four blocks away the second time. 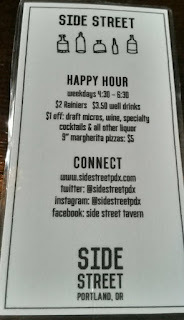 Side Street Tavern has Happy Hour from 4:30 PM to 6:30 PM on weekdays. 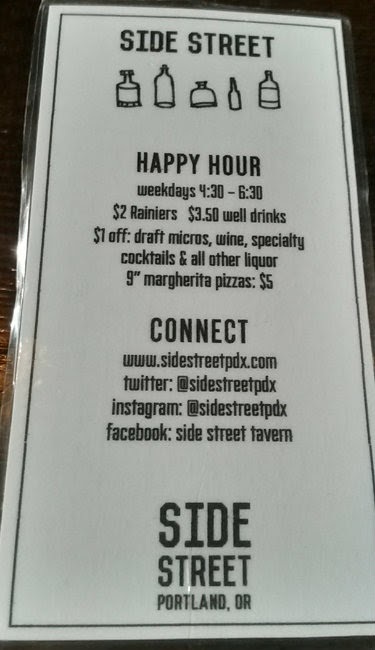 Their Margherita pizzas are only $5 during that time (as opposed to $8), so get a drink with it.